A new document introduced in the latest Apple versus Samsung trial shines a light on an ongoing point of contention for market share statistics: sales versus shipments. Sales of devices don’t always translate to shipments, but the two are often confused. It seems the document suggests that Samsung’s performance in the tablet market may not have been as successful as we have been led to believe. In fact, they may not have had much success at all. The trial, which has mushroomed into a war on integrity at this point, produced an internal Samsung document that showed their sales of Galaxy Tab devices was so slight they were being eclipsed by Kindle devices and Nook sales. Not only were sales known to be diminutive, Samsung knew about them, and purposefully mislead analysts and investors about the health of their tablet business. In slides from the trial, which you can see below, Samsung spells out Galaxy Tab sales both quarterly and annually in the US. 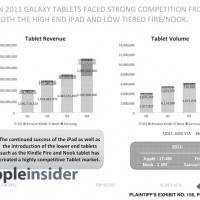 Quarterly sales were in the hundreds of thousands, while annual sales were roughly one million tablets for 2011. This was a contrast to — by Samsung’s own metrics — 17.4 million iPads sold, 5 million Kindle Fire tablets, and 1.5 million Nook devices sold in the US for 2011. This opens up discussion on two fronts: sales versus shipments, and device use statistics. Time and again, we find reports suggesting iOS devices — specifically iPads — have better web usage statistics. These reports are prominently rolled out just after the holiday shopping season, where it’s found that Apple’s devices command a much larger slice of both the browsing and online purchasing pie. Use of a device can be used to directly relate to sales. It seems we now have a reason for those numbers, and it has to do with sales versus shipments -- and how they're reported, both to analysts, and to us. Samsung tablet sales simply weren’t what analysts and investors were led to believe, causing inflated metrics and market share statistics. 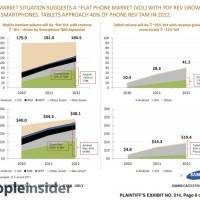 That, in turn, is related to us as a false sense of popularity for Samsung tablets. We’ll keep in mind the slides shown are internal Samsung documents, which lends a damning credence to the revelations.